I am here for: Even in her earliest works where the piano was a primary instrument, she weaves together many diverse influences, melding classical music, rock, and a wide range of ethnic and folk sources, to produce a uniquely impressive amalgam, and this has continued throughout her career. Interests: More than one reviewer has used the term surreal to describe much of her music, for many of the songs have a melodramatic emotional and musical surrealism that defies easy categorization. It has been observed that even the more joyous of the pieces is often tinged with traces of melancholy, and even the most sorrowful have elements of a unique vitality struggling against all that would oppress it. The unapologetic use of her voice as an instrument to convey a broad range of emotional intensity and subtlety is one thing that characterizes nearly all that she does. Kate Bush has tackled sensitive and taboo subjects long before it has become fashionable to do so; Kashka From Baghdad is a song about a gay male couple; Breathing explores the results of nuclear fallout. Her lyrics are highly literate and reference a wide array of subject matter, often relatively obscure, such as Wilhelm Reich in Cloudbusting, or G. I. Gurdjieff in Them Heavy People. 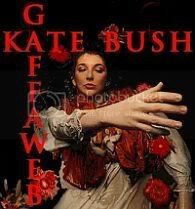 The lush arrangements, complex production and intelligent, thoughtful lyrics can sometimes mask the fact that Kate Bush is a peculiarly witty writer and that comedy is not only a big influence on her - she has cited Monty Python, Woody Allen, Fawlty Towers and The Young Ones as particular favourites - but also a significant component of her work. 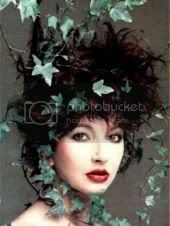 Kate Bush (born Catherine Bush on 30 July 1958 in Bexleyheath, Kent (now part of Greater London) is a British singer-songwriter known for her expressive 3-octave voice, idiosyncratic and literary lyrics, and eclectic and meticulous musical and production style. She has acquired a large number of extremely devoted fans since her debut in 1978 with the surprise hit "Wuthering Heights", which was number 1 in the British music charts for 4 weeks. 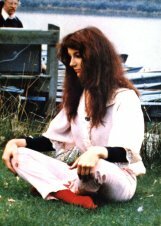 While still attending St. Joseph's convent school in Welling, South East London where she studied the piano and violin, Kate Bush caught the attention of David Gilmour of Pink Floyd, who helped fund her first demo sessions. She signed a contract with EMI when she was 16. However, in the first two years of her contract, Bush did not release an album, but instead completed her time at school and had lessons in dancing, mime, and music. During this time, Bush wrote and made demos of close to 200 songs, which today can be found on bootleg recordings (often known as the Phoenix Recordings). She also performed at various small venues in and near London under the name KT Bush Band. Her first album, The Kick Inside, was released in 1978, and featured songs she had written during the previous two years, including the single Wuthering Heights, which topped the UK charts and became an international hit. A period of intense work followed. A second album, Lionheart was quickly recorded; Bush has often expressed disatisfaction with it, feeling she needed more time to get it right. Then there was the endless promotional work and an exhausting tour, the only one of her career. Kate disliked the exposure and the celebrity lifestyle, feeling it was taking her away from her main priority: making music. A slow and steady withdrawal from public life began as she moved into producing her own work with Never For Ever and developed a perfectionistic, painstaking approach to making music which would see her ensconced in the studio for long periods and only needing to face the glare of the press when the subsequent albums were released. Wild rumours would fly while she was engaged in her work - usually that she had ballooned in weight or had gone mad. Then she would re-emerge for a brief period, slim and seemingly sane, before retreating to the studio once more. 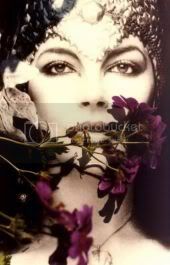 A pattern began to form in the eighties where Kate would disappear for up to four years while she honed her new material until it was ready for release. After the release of The Red Shoes in 1993 there was no reason to suppose that she wouldn't reappear in three or four years with another set of songs. But the period of silence that followed her seventh studio album was much longer than anyone had anticipated. Bush dropped out of the public eye for many years, although her name occasionally cropped up in the media in connection with rumours of a new album release. There were also unconfirmed reports that she had suffered a nervous breakdown. The press continued to speculate wildly about what she was up to and the usual scurrilous rumours appeared. The press attempted to paint Kate as an eccentric recluse, sometimes drawing a cliched comparison with Miss Haversham, from Charles Dickens' Great Expectations. In reality, she was simply trying to give her young son a normal, happy childhood, away from the world of show business: Bush gave birth to Albert, known as Bertie, fathered by her guitarist and current partner Danny MacIntosh, in 1999. She didn't release the news of his birth to the press and it was over two years before the story broke. Her quite normal decision to protect her son was depicted as eccentric in the article that reported the news. On the few occasions she has spoken to the press since Kate has made it clear how happy motherhood has made her. On 31 August 2005, EMI put speculation to rest and confirmed that Kate's eighth studio album Aerial will be released on a double CD on 7 November 2005 internationally and 8th November in the USA, after a single release "King of the Mountain" on 24 October. The song will be available for download on 27 September on all major internet pay-for-download services including Napster, Rhapsody, and iTunes. Go to Kate´s myspace archive. Listen to more Kate music. Read the online book Cathy. We are in no way affiliated with EMI/Sony Music. Oh Kate, my lionheart!!! Happy birthday Kate!!! I love you, i love you, i love you, i love you!!! Please, come to Argentina, please!!! Hi Kate- I just joined- You are awesome! In a gray City for who the lights shining? Kathy in romantic city at night! 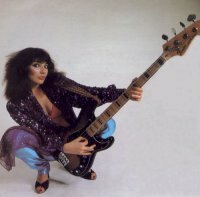 Hi, is this the real Kate Bush or another one of your clones that seem to be multiplying on MySpace? Regards, a dissilusioned fan. Who lovest you the most baby? I wasted hours making mykatespace site, I need to get out more. John. You have invested alot of effort into this system, my dear. It's very impressive. 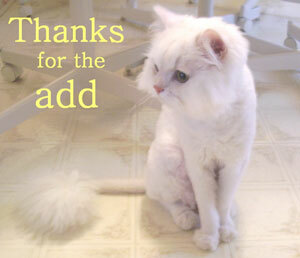 Still trying to get acquainted with how things work, but I wanted to thank you. Kate forever & ever! Glad to hear from you~! Thanks for comment. I`m a huge fan of Kate for 2 decades now. For all these years her music was main inspiration to me. Was and will be. hi!!!! thanks for the sweet comment.i am so glad you have this katespace now cause your page kept getting deleted from myspace.you have always been one of my top favorites since the late 70s!!! !your music always cheers me up!!! best wishes to you!!! !